I'm kind of a no nonsense girl when it comes to the creative arts. While I don't mind the process, I'm more of a product oriented DIYer. When it comes to painting, sewing, decorating, it's got to be easy or I'm not giving it a go. And those are pursuits I really enjoy, so you can imagine that when it comes to cooking, I'm downright lazy. I look for every shortcut out there and take them all. Sometimes it works out really well, other times, it's kind of a mess. Thankfully, my attempt to simplify a French toast breakfast was not. With a house full of people all coming and going at different times of the day around here, it's hard to keep the kitchen clean. I seriously could stand in front of that pretty skirt with the water running all day long and have something dirty handed to me. Oh, I'm not complaining. 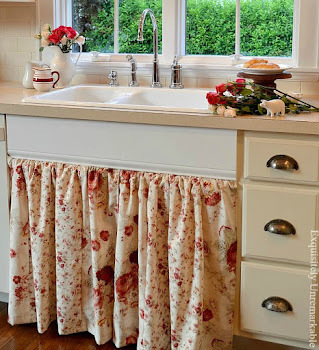 I know these days are fleeting, and I adore the hustle and bustle, but one morning I woke up to a ton of looming deadlines, and the thought of washing even one more bowl was going to send me over the edge. But man I wanted French toast. So, I cut many corners and made it in one pan. No bowl, no measuring cups, no whisk. No milk. And you know what it was delicious. Took me less than 5 minutes from start to finish and when I was done, I had one fork, one spatula and one pan to wash. I could deal with that. 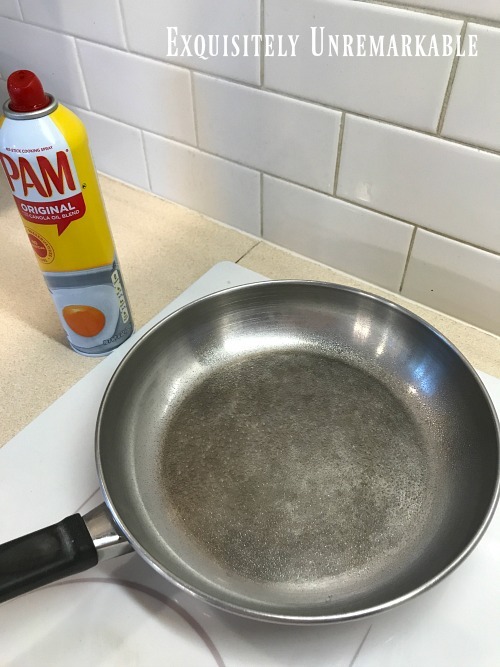 So I start with a pan, spray it with Pam (or a nonstick spray of your choice) and then turn on the heat. 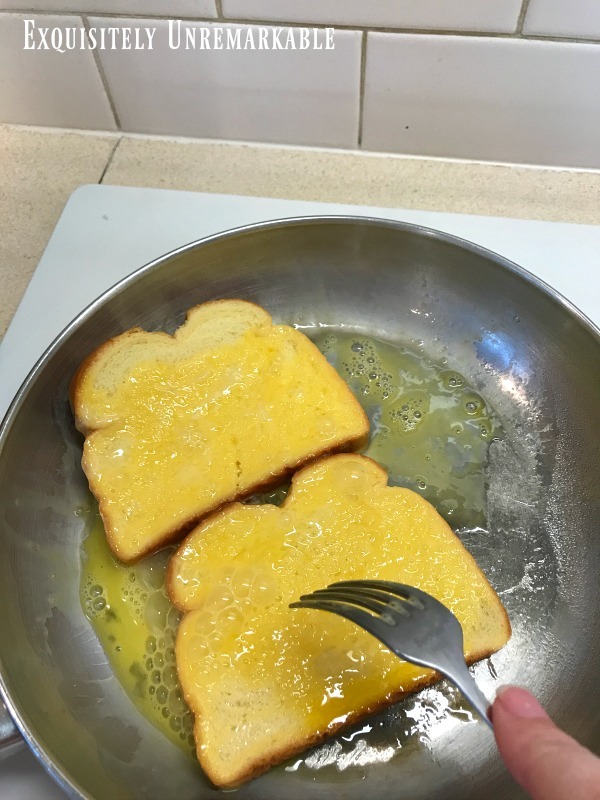 While it's getting hot, I grab the eggs and bread. 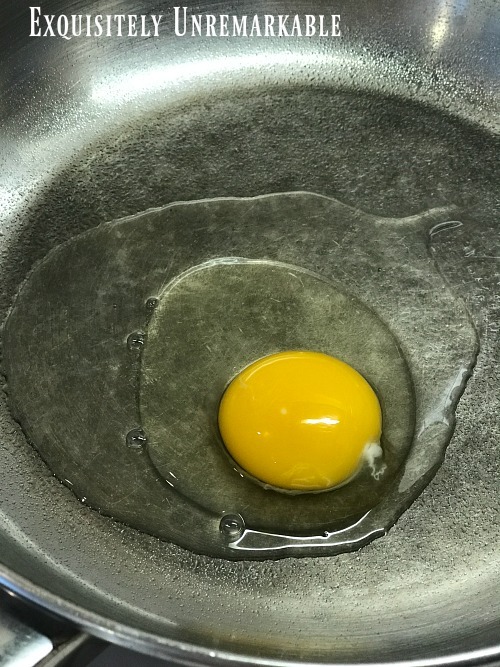 Don't cringe, but I crack the egg directly in the pan. For two slices of bread, I only need one egg. I take a fork and scramble it. Again in the pan. I don't mix the egg and milk in a bowl and dip. That takes too long. It's all happening in the pan. Now, I'm not a fan of cinnamon, but my kids are, so sometimes, I sprinkle a little in the pan, on top of that scrambled egg. Then I add the bread to the pan. I use a fork to move the slices around in the egg until they're completely covered. Then I flip them and cover the other side in the raw egg. 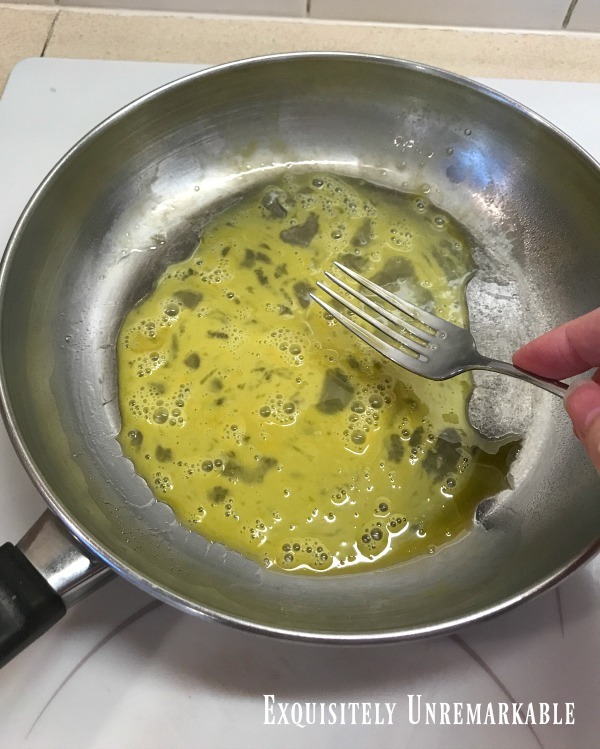 I flip them a few times actually, until the egg is mostly sopped up, then I just let them cook and turn them over and over with a spatula, until they're done. I plop them on the plate, add a little butter and syrup and sit down to eat them with my big cup of hot water. As a matter of fact, I'm eating French toast right now. It's so simple to whip up and clean up that I've been eating it a lot lately. Of course, that doesn't really bode well for my waistline. What's your best cooking shortcut? Looks yummy Kim. Happy Friday. Have a good weekend. I hope it was delicious, Betty!! I love this idea. It would be so quick and easy to do for my husband. 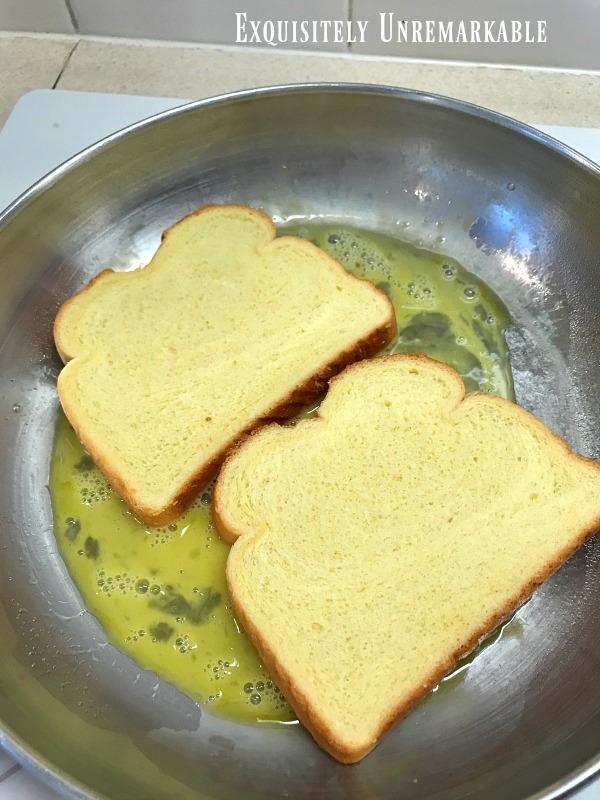 Do you ever make French toast casserole? 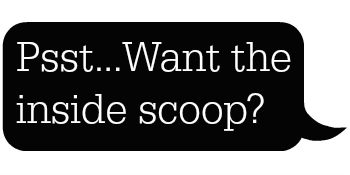 There are oodles of recipes for out there. I make it for breakfast brunch at my house. It is quick, easy, and as my cousin said, soooooo delicious. I have never tried a French toast casserole, Sally, but I googled it once you mentioned it and it's on the list!! Thanks for suggestion. I LOVE French Toast! Perfect.. thank you for sharing. I'm slightly addicted lately Carla!! Yum!!! 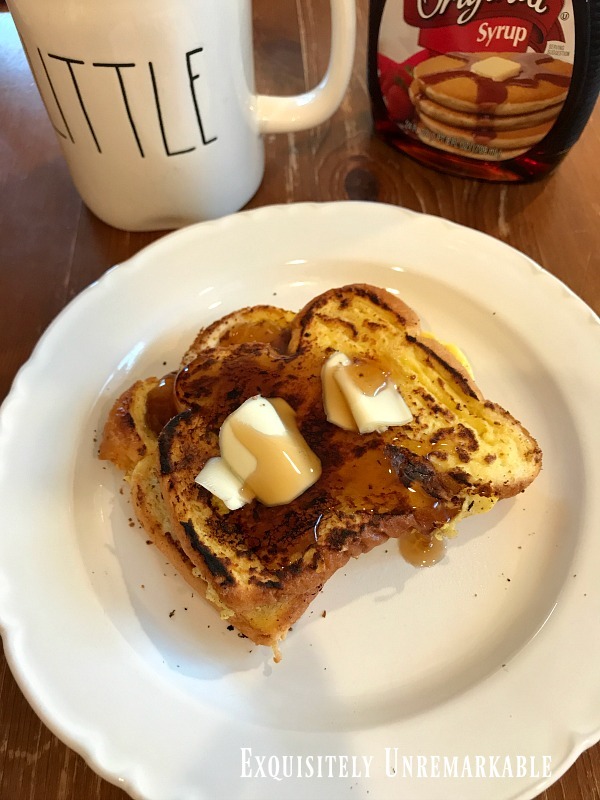 I love french toast and your way is the best! That syrup is making my mouth water! I add powdered sugar to my french toast too. :) I mean...if you're going to splurge. Lol! I agree, Lisa! powdered sugar on anything always makes me feel like I'm a restaurant! but it does give a wonderful flavor in the egg. ok. going to fix some French toast right now! I hope you enjoy it Tammy!! It's been doing very bad things to my waistline...I need to stop. Maybe I should go back to the long, dirty dish process so it's less appetizing! Ha! Oh my goodness - you are brilliant! I'll be trying this. You are making me blush, Mari!! Hi Kim, that’s a really easy way to make French toast. I will have to give this a try. Stay warm and have a nice weekend. Thanks Julie! Winter is a great time for a warm breakfast! You make it look easy...and yummy! Thanks so much...it's a little too good!! That's so funny...that's what I used to use, too. It's the perfect shape! Try Mexican Eggs. You need a mug (micro safe), shredded cheese (I use a 3-cheese combo), egg(s), and salsa. Spray your mug with baking spray, whisk your egg well in the mug, add a dab of salsa and a little cheese. Mix it up good with your egg. In a 1000 watt microwave, I cook one egg for one minute, 2 eggs for 2 minutes(use a large mug for 2 eggs). Let cool for a minute then dump onto your plate & top with a little more cheese! EZ-PZ. Wow, Cheryl, this sounds so good and so easy and quick! It's on the list now, for sure!! Kim that is cheating. Haha! But if it works why not? Anything to have to wash less dishes! A nice way of saving an extra dish or bowl from having to be washed. I would just add a little milk or cream to the egg and some cinnamon to the egg too. I had to laugh tat the title Lazy girl. My husband makes it that way and it still works! Yum! Your French Toast looks delicious! I'm all about "one-pan" prep and cook if I can get away with it. It just makes life so much easier! Love and hugs! One pan anything is my type of recipe, too!! Happy Valentine's Day!! I guess the Crockpot would be considered my cooking shortcut since that takes little effort. I haven't had French Toast in 15-20 years! I'm not much of a French Toast/waffle/pancake person. I love my crockpot, Melanie. I use it often, too. It is a shortcut. And I shouldn’t be eating pancakes, waffles or French toast. Butter, syrup….sweets. Not great for me!! I adore French toast! Not sure I'll try it your way, dear sweet Kim. Forgive me please but I think I'd miss the real cream I mix in with the beaten eggs--and that splash of Grand Marnier I indulge in! Girl, don't you know the dishwasher is made for dirty bowls? Wait, did you actually just post a recipe?????????????? Holy smokes, lady!! Well, aren't you a lucky lady!! That sounds delicious...and Happy Valentine's Day, Nancy! Hugs!! Thanks Jan! It's not fancy, but it is good. Very clever shortcut. I make it the old way but usually for a crowd. This way is perfect for just a couple of pieces. Too easy, Lorri. It’s putting on pounds. I need to go back to the long way or eat a yogurt instead!! Ha! !